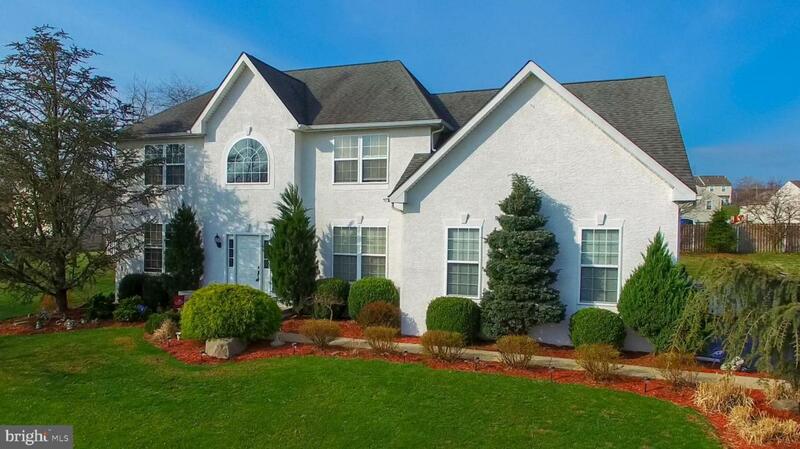 Beautiful well maintained 3830 sq ft. 4-5 bed 2.5 bath home located in Upper Hanover Twp. This home will not disappoint! Upon entering you will be greeted by a large 2 story foyer with gorgeous hardwood floors. To the left you will find the formal LR & DR- surround-sound throughout. To the right, double doors leads you to study/5th bedroom. Leading down the hall is a fabulous kitchen boasting tons of cabinets, center island and breakfast nook. This is open to the FR with gas fireplace. The 1st floor is completed by a convenient powder room and mud/laundry room. Upstairs you will find a master suite with 2 walk in closets, sitting area, and an amazing en-suite featuring soaking tub, shower and double vanity. 3 additional spacious bedrooms with a hall bath round out the 2nd floor. If that is not enough you will not be disappointed by the fully finished basement! Great man cave, exercise room, play room many possibilities! Newer heating system, basement exhaust system, and A/C unit. Many upgrades throughout this home! Seller did not spare any expense! 2 car attached garage, mature landscaping, above ground pool, patio and fenced backyard. This is a must-see home!